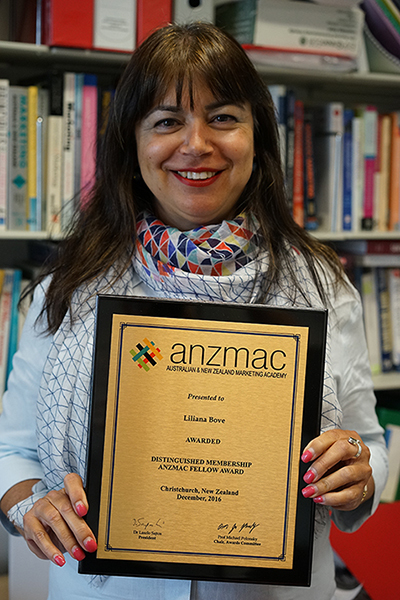 Marketing Professor Liliana Bove was awarded distinguished membership of the Australian & New Zealand Marketing Academy (ANZMAC) in December, joining an esteemed list of 29 academics - and one of only seven women - currently holding the honour. We talk to her about what the award means and the research efforts that earned her the recognition. What does being awarded Distinguished Membership of ANZMAC mean to you personally and professionally? Fellowships are conferred on nominated members who, in the opinion of the Executive Committee and the existing Fellows, have demonstrated outstanding contributions to the academy and also eminence in the marketing discipline through research, scholarship, education and leadership.Having been born and educated in Australia, I appreciate that we are relatively isolated from the United States and Europe and it is only through conferences, study leave opportunities, and visiting professors that we build our networks and remain connected. This is fine when you are well-resourced, but many Australians and New Zealand doctoral students and early career researchers do not get the benefit of good training, mentoring nor the development opportunities that we offer here at the University of Melbourne. ANZMAC helps fill this gap particularly through the active engagement of its Fellows. As you can expect, raising the research capabilities of marketing academics in the region helps Australia and New Zealand maintain its reputation for impactful research. This is the reason why I am passionate about the Academy, so, personally, it has been very rewarding for me to have my contributions recognized by both its executive and existing fellows. Given the award acknowledges demonstrated eminence in the marketing discipline through research, scholarship, education and leadership, could you outline some of your recent contributions to the field? I am best known internationally for my work on customer relationships with service personnel and how this contributes to loyalty to the business. There has been a tendency to discourage professionals, such as consultants, lawyers, accountants and key account managers, from forming trusting, committed relationships with clients for fear that the client would follow the professional if they left the firm. To combat this, many firms use a team approach in managing clients. However, my research has shown that personal loyalty significantly benefits a firm, and if clients perceive other professionals in that firm as credible, they will stay with the firm in the event of their professional leaving. My other contributions have been in the field of customer citizenship behaviour and how to encourage these to benefit the firm. A spin-off of this research is an interest in donors, especially in terms of their recruitment, retention and management. To this end, my blood donor research findings have led to positive changes in managerial practices at the Australian Red Cross Blood Service, including their approach in recruiting donors for the plasma panel, and decreased use of communications that imply donation status hierarchy. What are you, and the marketing team, currently working on and what are your aims for this year? I have just begun an exciting project with a London-based research team to determine how freelancers win bids in online service marketplaces – digital platforms that allow firms or individuals to hire freelancers who compete on a per-job basis in a reverse-auction process. Platform reputation mechanisms, such as positive reviews and number of jobs completed, are heavily relied upon by clients as they are typically selecting freelancers who are strangers to them. But these reputational signals are problematic, and there is evidence of discrimination with respect to a freelancer’s gender, ethnicity, race and age, as well as accumulated advantage over time for those who already have a reputation. The greatest limiting factor of all is that reputational indicators cannot be transferred between platforms, obstructing the entry of ‘new’ freelancers into the marketplace, who, as a result, then often need to sell their service at a lower price to win the bid to start the process of reputation (re)construction. We feel we have discovered a way in which new freelancers to the platform can beat the lack of reputational cues and win the bid without compromising on wage. It involves adapting the communication style used in their written bid to that of the client, as reflected in the project proposal. Stay tuned for our findings! The marketing team here in the Department of Management and Marketing are working on an exciting range of projects that have relevance and impact to society. For example, Anish Nagpal is investigating the impact of front-of-package food labels on consumers’ food choices, while Jing Lei is researching how consumers trade off healthiness and tastiness of food items when making product choices. Julie Ozanne, Michal Carrington and Greg Nyilasy are investigating how people with coeliac disease navigate eating out at restaurants and food practices at home to manage their gluten-free needs. Danielle Chmielewski-Raimondo in studying how locally-based corporations addressing poverty build and define success. Julie Ozanne and Marcus Phipps are exploring how grassroots tactical urbanism helps provide novel solutions to the affordable housing crisis, and Robin Canniford is investigating practices of rural life as forms of inalienable wealth within economically depressed areas of the United Kingdom, while Nicole Mead is studying how an individual’s change in physical environment improves their willpower to make positive changes in behaviour. Ben Neville is researching how the Divestment movement is seeking to stigmatise and negate the political influence of the fossil fuel industry, while Simon Bell is exploring how improvisation helps frontline service employees cope with demanding customers and Brent Cocker is examining what causes the different types of arousals to activate consumer motives to share online. Finally, Ilkka Ojansivu is understanding how companies organise marketing through various temporary and permanent arrangements (also known as hybrids) to respond to the challenges in their environment, while Kanika Meshram is studying how marginalised communities trust and experience value within an informal money lending service system in India. The Marketing team is working on an exciting range of projects, which apply marketing theories and practices to help solve complex customer, organisational and societal problems. The team has high international recognition and has been published in the very best journals in the field. We also consistently obtain some of the highest student teaching evaluation scores in the Faculty. As Deputy Head of the Department of Management and Marketing, my aim this year is to continue to support all my colleagues in any way I can. My key passion is to strengthen our reputation globally so that we attract the very best doctoral students and academics who want to build their career at the University of Melbourne, so that this high level of performance continues.